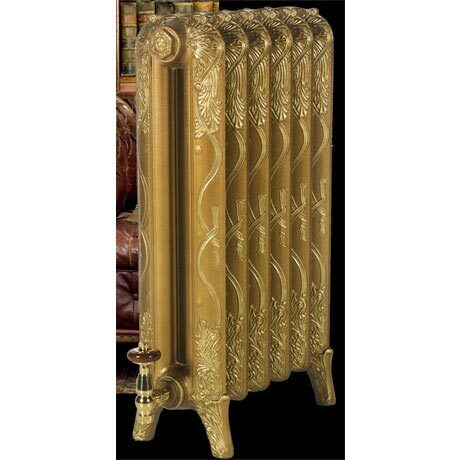 The elegant Piccadilly cast iron radiator features stunning detailing in the form of flowing Celtic ribbons intertwined with leaves and crowned with scrolls. A great centrepiece for any room it also offers excellent heat output. The Piccadilly is custom built in all sizes from 4-30 sections and is available in heights of 460mm, 660mm and 760mm. Finish Options: For painted finishes we will contact you once your order is placed to confirm which colour(s) you require. View available finish options in product additional images. Primed Black - Primed with a black undercoat ready for you to paint it in a colour of your choice. Metallic Painted - Striking metallic paint finish that is hard wearing and washable. Choose from Old Penny, Pewter, Antique Gold, Natural Cast, Sovereign Gold, Anthracite, Copper and Old Pewter. Antiqued Effect - Accentuates detailing bringing out the beauty of the raised etched mouldings on ornate radiators or brings an added depth of colour on plainer styles. Highlight Paint Effect - The beautiful moulded detail is highlighted by hand on top of its base colour in a choice of rich gold, striking pewter or warm copper. Traditional Polished - A luxury finish, each section is hand polished and buffed to a high shine giving a magnificent look. The back area is left unpolished for placing against a wall. Please note: radiator valves not supplied but can be purchased separately.